If you haven't yet read "Made to Stick," I cannot recommend it enough, as an excellent resource for learning how to make your ideas stick in your audience's mind long after your presentation has ended. The six principles of a sticky idea are represented by the acronym SUCCESs: Simple, Unexpected, Concrete, Credible, Emotional Stories. Yesterday I saw a great example of making an abstract concept concrete, when the CEO of the Humane Society of the United States, Wayne Pacelle, described the living conditions of a laying hen in a battery cage. He was on "Ellen," educating the audience about California's Proposition 2, the Prevention of Farm Animal Cruelty Act. In describing the hens' living space, he first explained that battery cages cram 6-8 birds together, providing the equivalent of 67 square inches per bird of living space. He then asked the audience to picture an 8 1/2" x 11" piece of paper, which equals 93 square inches. Fold over 1/3 of the piece of paper, and that's 67 square inches -- the amount of space one hen lives in for her full life span of 15 months, unable to spread her wings, nest, walk or perform any natural behaviors. He also used the analogy of 8 people trapped in an elevator for 15 months. Simple. Concrete. And completely inhumane. 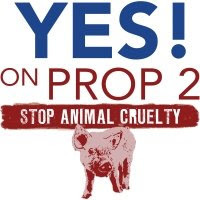 Vote YES on Prop 2. There you go again: you've hit the nail on the head. Although we call it "speaking", what we are really doing is telling stories. Some of us are better at this than others, but when you run into somebody who VERY good it really sticks with you. Going all the way back to our tribal campfire days, this has been how we've always gotten a point across. Thanks for your comment, Dr. Jim. Stories provide those mental pictures that help abstract become concrete. PPt takes the place of the mental pictures and, if it's well done, can still help tell a good story. If not well done, you've wasted a great tool!